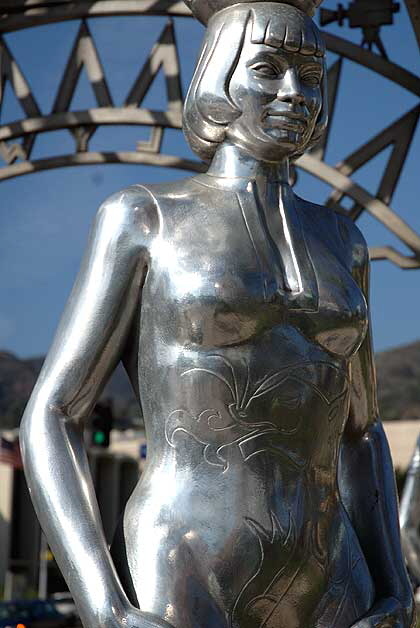 The Hollywood La Brea Gateway, the stainless steel gazebo on the southeast corner of Hollywood and La Brea, sometimes called the Four Ladies Statue, welcomes you to Hollywood. 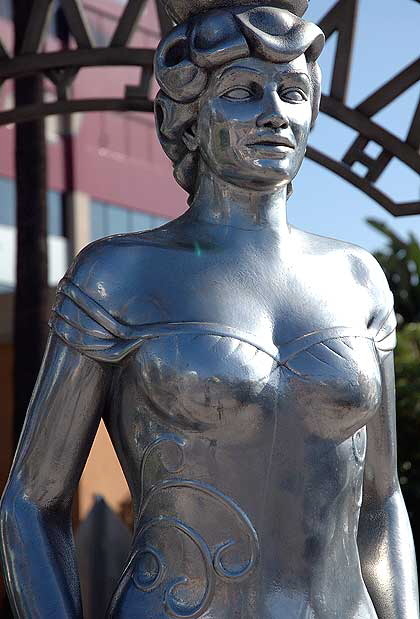 It's by production designer and director Catherine Hardwicke, from 1993 – a tribute to the multi-ethnic women of Hollywood, as the four life-size silver women supporting the structure are Mae West, Dorothy Dandridge, Anna Mae Wong and Dolores Del Rio. You decide which is which. Marilyn Monroe is still up top. 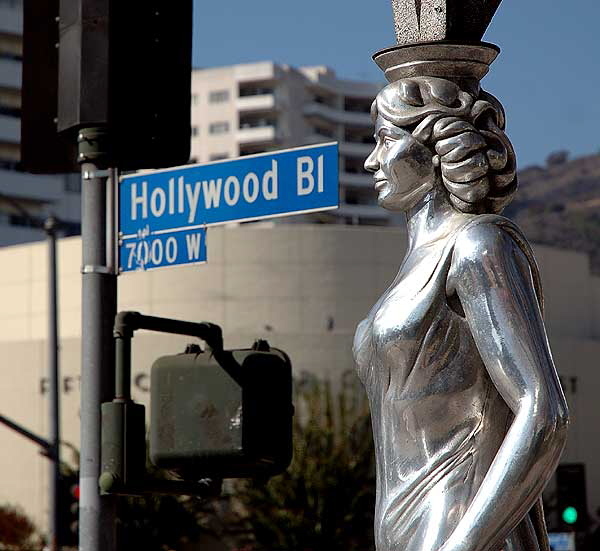 Marilyn Monroe is also hiding, just down the street. If you wish to use any of these photos for commercial purposes I assume you'll discuss that with me. And should you choose to download any of these images and use them invoking the "fair use" provisions of the Copyright Act of 1976, please provide credit, and, on the web, a link back this site. Most of these photographs were shot with a Nikon D70 - using lens (1) AF-S Nikkor 18-70 mm 1:35-4.5G ED, or (2) AF Nikkor 70-300mm telephoto, or after 5 June 2006, (3) AF-S DX Zoom-Nikkor, 55-200 mm f/4-5.6G ED. They were modified for web posting using Adobe Photoshop 7.0. 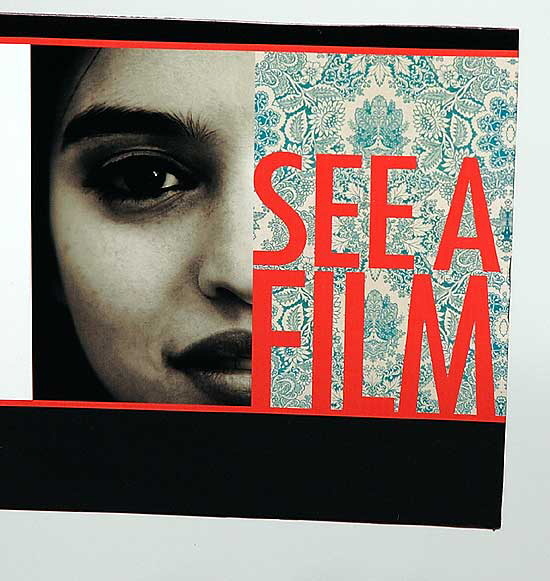 Earlier photography was done with a Sony Mavica digital still camera (MVC-FD-88) with built-in digital zoom. Dates: 1993, dedicated February 1, 1994. Medium: Gateway: stainless steel, glass, neon, gilded metal; Base: concrete, granite tile. Dimensions: Gateway: approx. 30 ft. x 11 ft. 6 in. x 11 ft. 6 in. ; Base: approx. 12 x 12 x 12 ft. 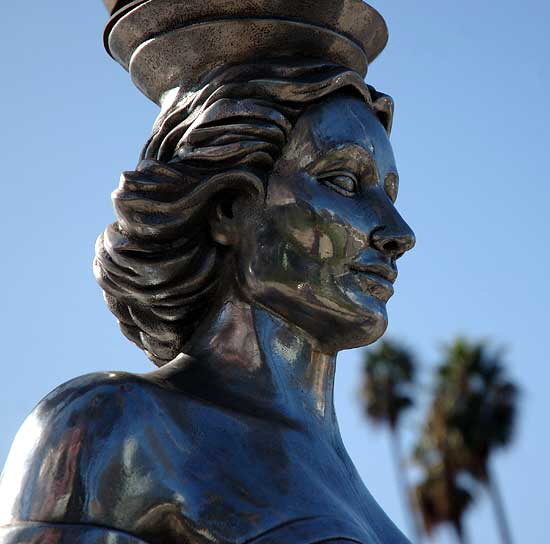 Description: Sculptural four-sided gateway is an art-deco style gazebo with four stainless steel full-length portraits of Hollywood actresses supporting an open roof structure. The actresses portrayed are Mae West, Dorothy Dandridge, Anna May Wong and Dolores Del Rio. 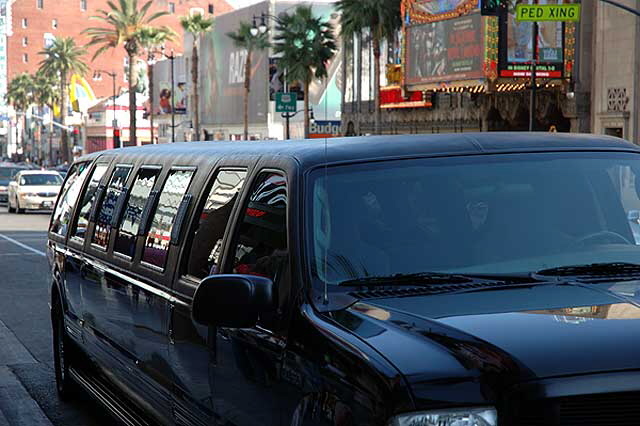 All four figures wear glamorous long gowns. Each figure stands on a square base. A spire rises from the top of the rounded, open gazebo roof. Neon lettering runs vertically down the four sides of the spire. 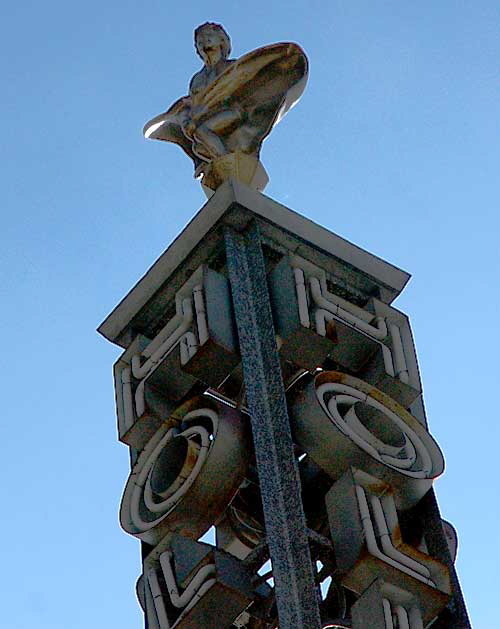 At the top of the spire is a small windvane. 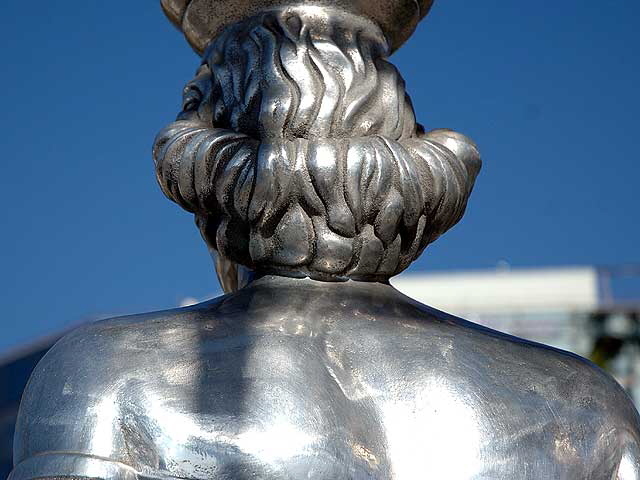 The windvane is a gilded full-length portrait of Marilyn Monroe holding her billowing skirt in place. The gazebo stands directly on a plaza. The plaza floor within the gazebo is granite tile mosaic patterned in the shape of a star. Remarks: The gateway was commissioned by the Community Redevelopment Agency (CRA) at a cost of $75,000. Hardwicke was commissioned to design the gateway. Subcontractors included Brogan who served as technical artist; West who served as sculptor; Prantis who supervised the work; and Chase who designed the graphics. IAS files contain copies of related articles from Vogue, Dec. 1993, pg. 84; Park Labrea News/Beverly Press, Feb. 17, 1994 and Los Angeles Times, Jan. 19, Feb. 14 and 28, 1994, which discuss the controversial piece.